Quiet and peaceful, Hoi An is a small city in Central Vietnam famous for its beautiful Old Town and excellent beaches. 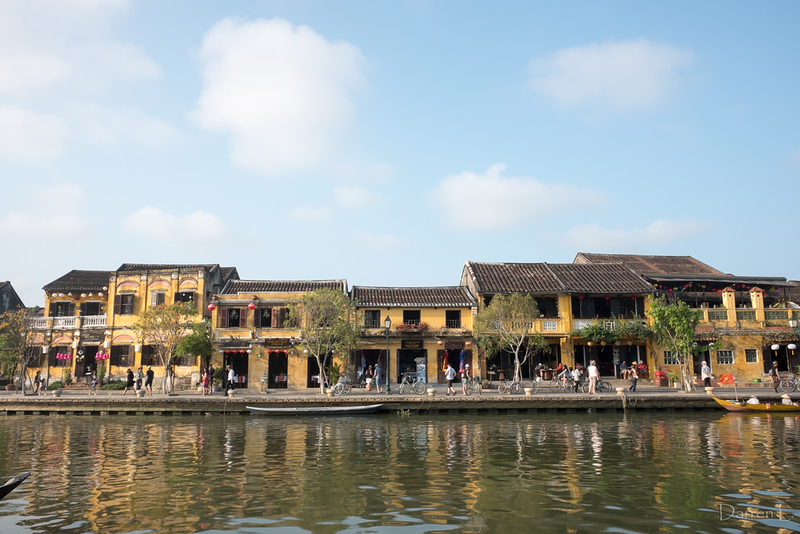 A UNESCO World Heritage Site since 1999, Hoi An is one of the most popular destinations in Vietnam for tourism outside the country’s two major cities. 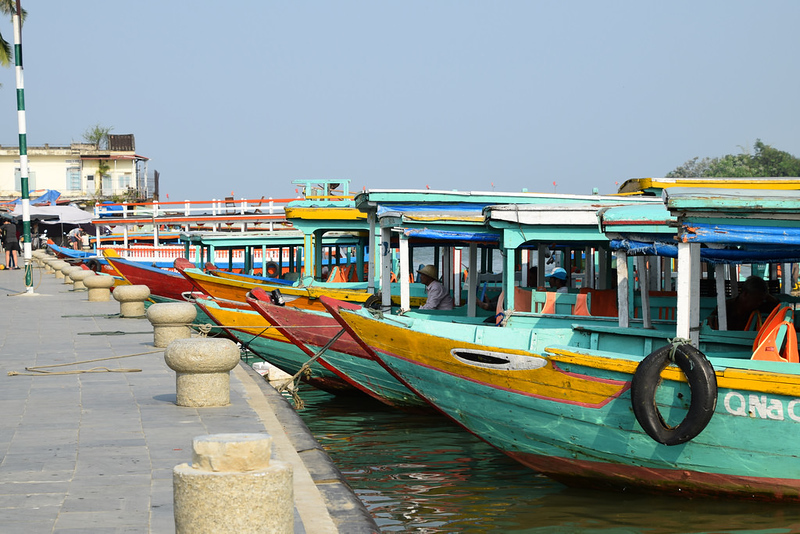 Hoi An has a great range of things to see and do, from historical sites in the Old Town to calm, beautiful beaches. It’s also home to a great range of restaurants, cafés, hotels and resorts with prices to suit everyone from backpackers to luxury travellers. Since Hoi An is located close to the geographical centre of Vietnam, it’s best visited between Hanoi and Ho Chi Minh City. 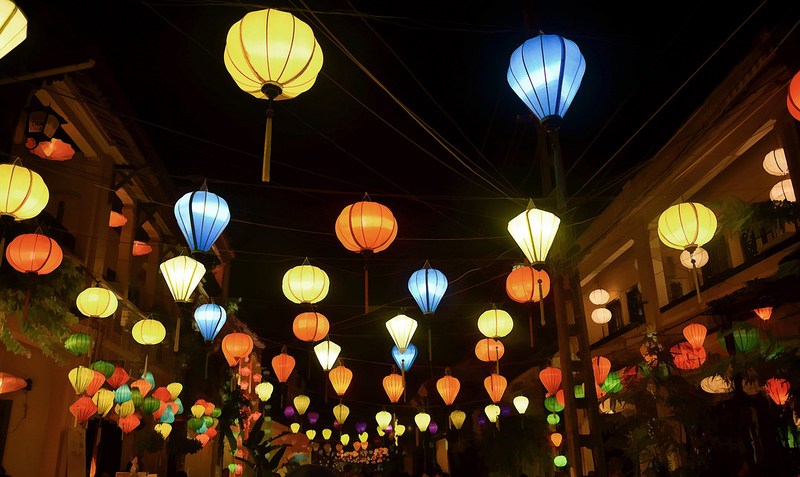 Most visitors to Hoi An stop in the city for two to three nights after flying into nearby Da Nang. Hoi An is a small city with only a few major areas. Almost all of the city’s tourist attractions can be found inside the Old Town, which is made up of just over 1,100 timber and concrete buildings on the bank of the Thu Bon River. The Old Town of Hoi An is by far the city’s most popular destination for visitors, with a selection of historical buildings, pagodas and museums. We’ve features the best things to see in the Old Town in the “Things to Do in Hoi An” section below. Hoi An is located a short distance from several beaches, the best of which is An Bang. Just over four kilometres outside the city centre, An Bang Beach is a great place to enjoy the sun (or use one of the many umbrellas for shade) or relax with a cold drink in one of the beachside bars. Hoi An’s second beach, Cua Dai, is another great place to enjoy the hot weather and clear, calm water. Compared to An Bang Beach, Cua Dai has deeper water and severe erosion, making it a good place to swim but less than ideal for relaxation and sunbathing. Hoi An’s Old Town is definitely the star attraction, with several stunning historical buildings and pagodas. Some of the most popular places to visit in the Old Town are the Japanese Covered Bridge and the nearby Precious Heritage Museum by Rehahn. There are several temples and pagodas around Hoi An, many of which were founded more than 500 years ago. Chuc Thanh Pagoda is the city’s oldest pagoda, with a history dating back to the 15th century, while Van Duc Pagoda is a great side trip for anyone visiting An Bang Beach. Hoi An’s beaches are great places to relax, swim and enjoy the sunny weather. An Bang and Cua Dai, both of which are listed in the “Main Areas of Interest” section above, are the town’s most popular beaches, with An Bang attracting the biggest crowds of the two. Hoi An’s beautiful countryside scenery and relatively less chaotic traffic than other Vietnamese cities make it a fun place to explore by motorbike. Motorbike rental is available from $5 to $7 a day, with bicycles also available for people that prefer not to deal with Vietnamese traffic. Over the years, Hoi An has grown into one of the top destinations in Vietnam for tailored clothes and shoes. Throughout the old town, you’ll find a variety of shops selling tailored suits, trousers, shirts, blouses, dresses and all sorts of other items. Quality can vary in Hoi An, with pricing usually reflecting the quality and durability of the clothes you’ll end up with. Some of the most popular tailor shops in town are BeBe ClothShop, Kimmy Custom Tailor and Yalo Couture, all of which have positive reviews from travellers and expats. Hotel Royal Hoi An MGallery is a five star luxury hotel located within walking distance of Hoi An Old Town. Rooms are spacious and beautifully decorated, with facilities that include an outdoor swimming pool in the hotel courtyard and several Vietnamese and international restaurants. Located on Cua Dai Beach, Palm Garden Beach Resort & Spa is a luxurious five star resort with a great selection of rooms and bungalows. Facilities include a large pool, fitness centre, gardens and health spa for guests, as well as a bar and several restaurants. One of Hoi An’s most luxurious resorts, Sunrise Premium Resort Hoi An offers direct access to Cua Dai Beach and a selection of luxurious rooms and private villas. The star attraction here is the beachside environment, with a huge outdoor pool and beachside dining for guests. One of Hoi An’s top rated mid-range hotels, Little Hoi An Central Boutique Hotel & Spa offers spacious rooms and suites a short distance from the Old Town. Facilities include an outdoor pool, spa and useful services like free bicycles for guests. Another highly rated option close to the Old Town, Hoi An River Town Hotel has fantastic river views and a variety of comfortable rooms. The facilities here are on par with much more costly hotels and include an outdoor pool, fitness room and Vietnamese and Western restaurants. Quiet and peaceful, Belle Maison Hadana Hoi An Resort & Spa is a four star hotel located less than 10 minutes from Hoi An Old Town by bicycle. Rooms are large, modern and comfortable, while the facilities include an outdoor pool, fitness centre and executive lounge. Despite its cheap pricing, Hoi An Green Apple Hotel is a luxurious and comfortable three star hotel that’s a great choice for budget travellers. Rooms are clean and modern, while facilities like a lap pool put this hotel far beyond most others in its price range. Cheap and comfortable, Jolie Villa Hoi An Homestay is a great budget accommodation option for guests that want to explore Hoi An on their own. Although it’s a 15 minute ride from the Old Town, the free bicycles provided for guests make it easy to travel around the town. Vaia Boutique Hotel Hoi An is an affordable, centrally located hotel close to Hoi An’s famous Old Town. Rooms range from regular double and twin rooms to large four-person suites designed for families. A great option if you’re visiting Hoi An on a limited budget. Aubergine49 is a quite, relaxing restaurant that serves high-end French and European food in a beautiful colonial house. Prices here are on the high side for Hoi An but still offer great value for the quality of the food available. Located inside the Anantara Hoi An, Lanterns Restaurant offers peaceful dining with a view of the Thu Bon River. The menu includes a great selection of Vietnamese dishes, as well as the usual Western favourites. Traveller favourite Café Tuan is a great place to enjoy Vietnamese and Western food. The food here is tasty and priced very fairly, while the indoor/outdoor dining area is a great place to relax and regain your energy after visiting the attractions in the nearby Old Town. No visit to Vietnam is complete without trying banh mi, and Phi Banh Mi is undoubtedly one of the best options in Hoi An. Cheap, simple and and tasty sandwiches here are available from as little as 15,000 dong and make for a great snack while exploring Hoi An. An Gia Cottage is one of several vegetarian and vegan-friendly restaurants in Hoi An offering a meat-free take on traditional Vietnamese food. The menu here also contains several dishes that contain meat, making it a great place to dine for mixed vegan and non-vegan groups. If you need a break from Vietnamese food, Jim’s Snackbar is one of the best choices you’ll find in Hoi An. This small restaurant makes excellent burgers and even offers a selection of vegan and vegetarian burgers and sandwiches. One of Hoi An’s most popular high-end Vietnamese restaurants, Baby Mustard serves excellent food with beautiful views over a local herb garden. One of the best places in Hoi An to eat while watching the sunset. 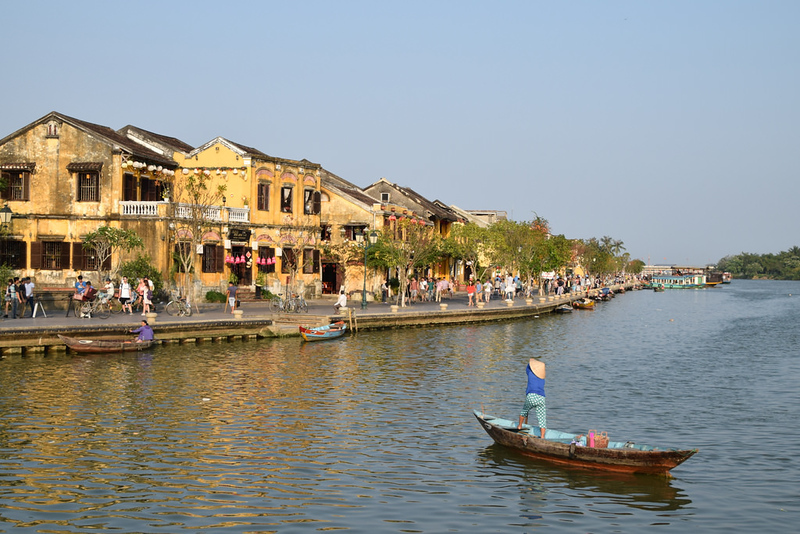 Despite its popularity, Hoi An can be quite a challenging destination to reach. Since Hoi An has no airport or train station of its own, the only way to reach the town directly is by bus from Hanoi or Ho Chi Minh City. A much faster and more convenient option is to fly into Da Nang, which is the nearest airport to Hoi An. Domestic flights are available from Hanoi and Ho Chi Minh City, often at low prices via budget airlines like Vietjet. From Da Nang, you can take a taxi to Hoi NA for $20 to $25, depending on the amount of time required for the trip. Most drivers will ask for 450,000 dong for the trip, which is about the same as you’d pay for a metered taxi. If you’re travelling from Ho Chi Minh City or Hanoi, flying into Da Nang and taking a taxi to Hoi An is always the fastest way to get to the city. Check Skyscanner to compare airlines for the best prices and flight times to Da Nang. Since Hoi An has no train station, you’ll need to travel into Da Nang if you’re coming from Hanoi or Ho Chi Minh City by train. 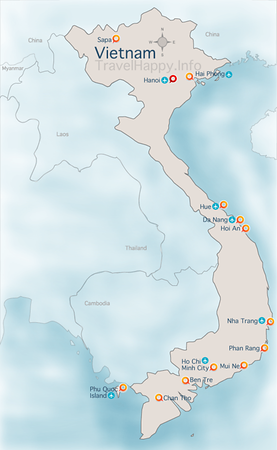 Trains also run from Vietnam’s smaller cities, such as Hue and Nha Trang, making it fairly easy to reach Da Nang from anywhere in the country. From the Da Nang train station, you can catch a taxi to Hoi An for the same $20 to $25 rate as listed above. Buses run from major centres such as Hanoi and Ho Chi Minh City to Hoi An, as well as from second tier cities like Nha Trang and Hue. If you’ve never travelled by bus in Vietnam before, it’s important to know that bus travel can be extremely slow. Expect to spend at least 10 hours on the bus from Nha Trang, and far longer from cities such as Hanoi and Ho Chi Minh City. Unless you’re on a very strict budget, it’s always better to fly into Da Nang and travel to Hoi An by taxi. The only exception is if you’re travelling from somewhere nearby such as Hue, in which case you can expect to spend three to four hours completing the 130 kilometre journey.